On either side P1 (pre communicating) segment of PCA absent. Pcoms arising from ICA continuing as PCA – Bilateral fetal origin of PCA, a normal anatomical variation. 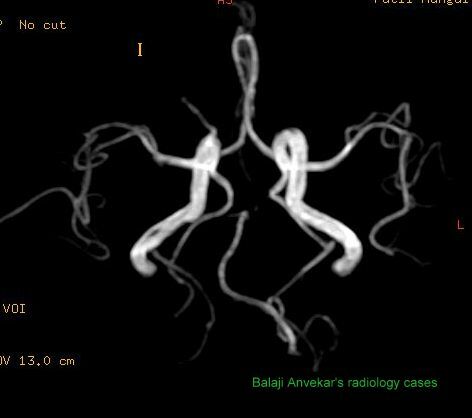 In fetal PCA or fetal-type posterior circle of Willis (FTP) there is an embryonic derivation of the posterior cerebral artery (PCA) from the internal carotid artery (ICA). In partial FTP, P1 segment is hypoplastic and in full FTP, P1 segment is completely absent and Pcom continues as PCA. At ~30 days of intra uterine life, the ICA, develops as a cranial extension of the paired dorsal aorta. Paired longitudinal neural arteries appear along the hindbrain and coalesce to form the basilar artery. The caudal divisions of the ICA anastomose with the neural arteries and become PCoAs. At ~ 8 weeks the PCAs are an extension of the PCoA. The vertebrobasilar system develops and thus participates in the supply of the PCA through the segment between the basilar artery and the pre communicating part of the PCA, the P1 segment. 1. Adult configuration, the P1 segment has a larger diameter than the PCoA. 2. Transitional configuration, the PCoA and P1 have an equal diameter. Both the basilar artery and the ICA thus contribute equally to the PCA. 3. Fetal configuration, Fetal PCA in which the P1 segment is smaller than the PCoA and the ICAs are the main blood suppliers to the occipital lobes. Fetal PCA is present in 20% of people (10% on each side) and bilaterally in 7%.